Want to find out all the details of how Rotorua Canopy Tours built the best zipline courses in the world? Find out here everything about the build and what it took to be one of the best ziplining locations around the world. Back in 2012 two university friends got together and decided to start a ziplining company. 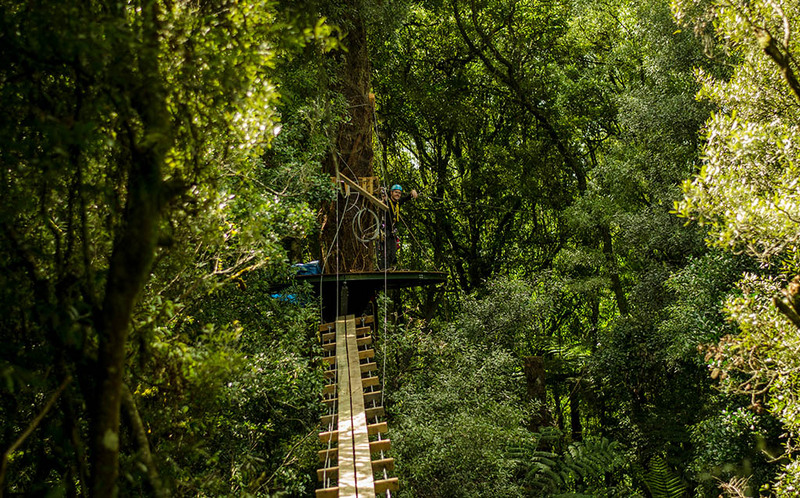 After months of research and planning they opened the first Rotorua Canopy Tours course - The Original Canopy Tour. The 3 hour Original Canopy Tour was a huge success with people visiting from all over the world - the company expanded into a new headquarters to house the influx of visitors and the increased number of staff. The Original Canopy Tour went on to winning national tourism awards, so in 2017 we decided it was time to build the best zipline course in the world - The Ultimate Canopy Tour. The Ultimate Canopy Tour has all the same fun things - ziplines, swing bridges and the most popular part of the tour - the conservation trail. 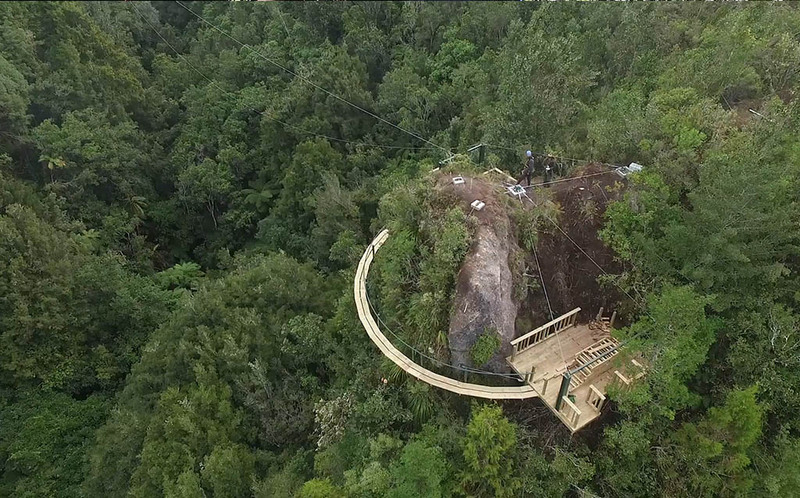 But it has some very special features that make it what we think is the best zipline course in the world. It features a cliff face walk, a controlled descent, spiral staircase and a 400-meter zipline which is our longest ever zipline. The Ultimate Canopy Tour is just bigger, longer and even more spectacular! Photo: Rotorua Canopy Tours guide Kris standing on a platform while building a swing bridge. A course of its nature doesn’t just pop up out of nowhere– there was a lot of hard work and planning that went into getting the Ultimate Canopy Tour to be the best zipline course in the world. Luckily for us we have a pretty amazing canvas – the Dansey Road Scenic Reserve – pristine and marvelous forest, ancient trees, gully's and deep ravines which helped make it that much easier to build the course. Keep reading to hear all about the behind the scene details! 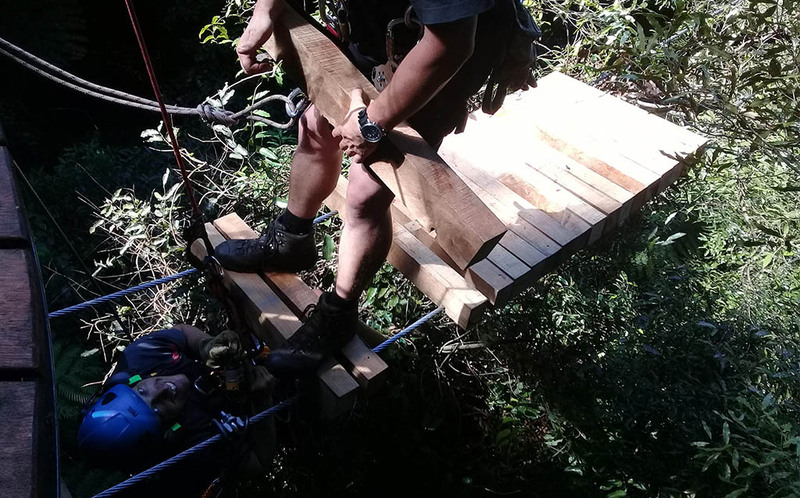 There was a big team that contributed to the build of the course and a lot of the skills and expertise came from our very own Rotorua Canopy Tours team. Our founding director, Andrew Blackford is an experienced engineer who was behind the scenes of the build, working on the design and engineering of the course. Scott, a guide at Rotorua Canopy Tours worked on the build full time, there was help from outside contractors and also from a few our experienced guides – Shane, Spencer, Cam, Josh and Luke. The guides loved seeing the course come together from being just a forest canvas to an incredible 3.5-hour adventure and to be apart of that was a special experience for them all. Photo: Andrew and Scott hanging at a height completing the Ultimate Canopy Tour build. The build took about six months, starting in November 2017 with a break over December and January - the peak holiday season. In February they returned to the build full time again working 5-6 days a week hanging at a height for 6 -7 hours. Luckily they had special seats mounted onto their harness so it was a lot more comfortable than it sounds. In July 2018 we launched the Ultimate Canopy Tour to the public and we couldn't have been happier to finally have our new tour up and running. How were the platforms built and put in place? At Rotorua Canopy Tours we are lucky to have a staff flat where staff that move to Rotorua can use as an accommodation option. Andrew and Scott used the flat to their advantage and pre-fabricated the platforms in the backyard, they could set everything up on the ground and make sure that everything fitted correctly. 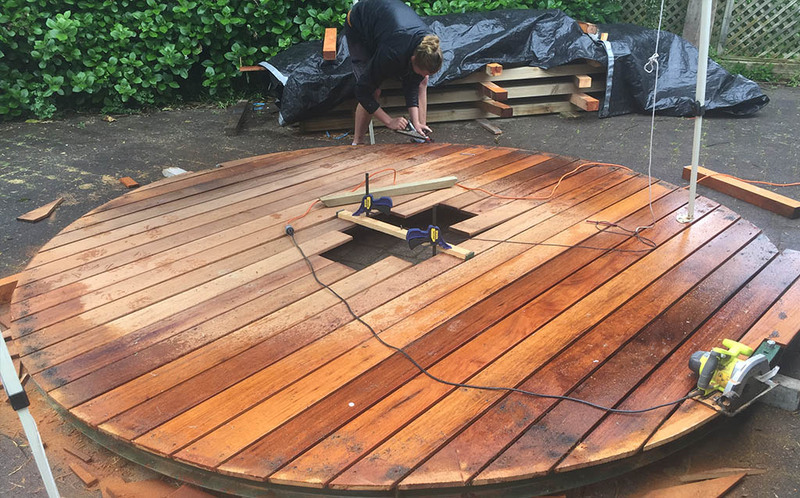 When it came time to put the decking on the frame, they lay it out on top and drilled 400+ holes into the structure. The biggest advantage was that when the weather wasn’t on their side they could keep dry by setting up a gazebo and carry on progressing with the build. Once the platforms were ready to go it was time to get them up in the forest. A laser system was used to get the height needed for the ziplines, an arborist came in to check that the trees could hold the platforms. Finally ropes lifted the platforms into place and then the platforms were connected to the trees. How were the ziplines put in place? Once the platforms were set and the height was accurate they could start flying the wire ziplines from one platform to the other. There were a few methods used – when the Original Canopy Tour course was built all of the ziplines were put into place by massive spud guns. The team used this method for the smaller ziplines on the Ultimate Canopy Course but for the longer ziplines they used a Phantom 3 drone which flew across a rope and then the zipline was pulled up by the rope. 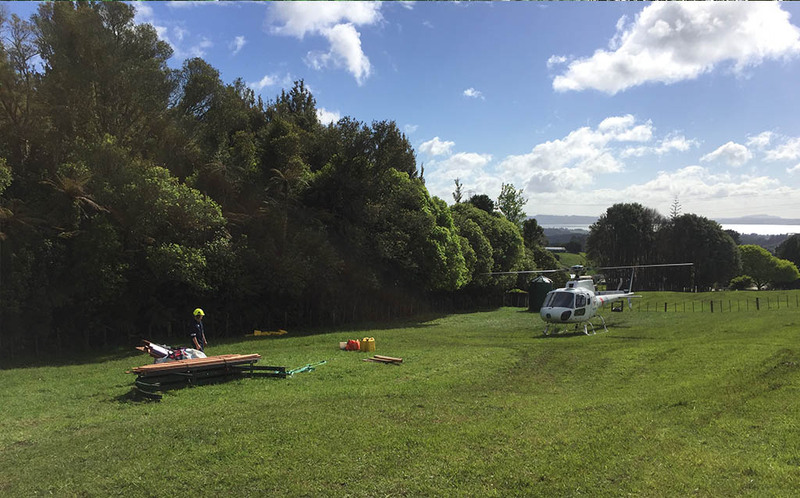 A helicopter was also used to put one of the ziplines in place – something a little bit different and exciting! The biggest challenge for the build was everything behind the scenes. A lot of time was spent making sure all the paper work and heights were accurate, but once all of that was in place the build wasn’t so stressful for the team. Scott told us that his biggest challenge was the platform tower at the end of the 400 metre zipline. The tower had a lot of extra bits involved, heavy steel work which was hard as they were also working at a height. Although it was a challenge, it was rewarding when it was completed as it is now an awesome feature on the course. The team behind the build are still working at the forest often doing maintenance work on both courses to make sure they are in perfect conditions. One of the projects they are working on is an added feature to the Ultimate Canopy Tour - a tandem zipline on the 400m course. It may be one of the best features we have ever had on our courses so stay tuned to find out when it's up and running.